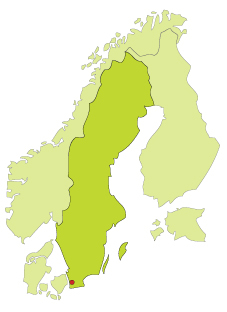 The south of Sweden is known for its variation and contrast of landscape. The coastal landscape is magnificent with long white beaches and light birch forests. Malmö, the largest city in this part of Sweden is a vibrant metropolis of art and culture. Take the opportunity to visit the architectural area in the western harbour and look at Sweden´s most famous skyscraper, the “Turning Torso”, built by the Spanish architect Santiago Calatrava. From Malmö it is easy to continue to Copenhagen, the capital of Denmark, by boat or by crossing the magnificent Öresund Bridge.